Mara Mladenovski, 22, of Hobart, graduates this May with a bachelor’s degree in psychology with minors in Spanish and communications. In high school, Mladenovski discovered an interest in the connection between mind and body. She knew she was headed toward a career in the health field but was unsure about which career to choose. It was throughout her educational journey at IU Northwest that her path became clear. 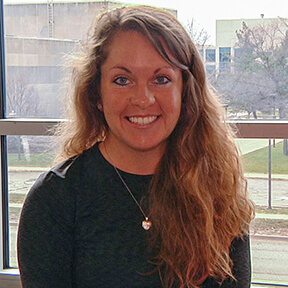 Mladenovski credits several faculty members with connecting her to opportunities that ultimately steered her toward her final destination: occupational therapy. Boasting a 3.984 grade point average, Mladenovski is a presidential member of the IU Northwest chapter of Sigma Alpha Pi, and a member of the National Society for Leadership and Success. As a student researcher in Frances Daniel’s Human Learning and Cognition Lab, Mladenovski received the honor of presenting her research at the Midwestern Psychological Association Conference in April. At last, Mladenovski says, she now has a clear vision about her health-related future. She will attend graduate school at Boston University with the goal of becoming an occupational therapist.